Brianna Lux grew up in Ohio but is “native” to DC based on the 7+ year rule. She started improvising in 2011, trained at WIT and DC Improv, and joined Nox! in 2013. 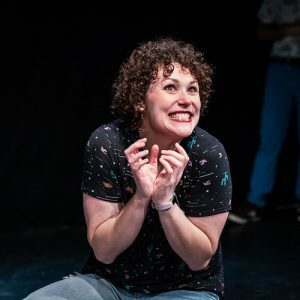 She has performed in WIT’s improv storytelling projects Lore (Capital Fringe Festival show) and Unraveled (collaboration with StoryDistrict) as well as WIT’s special project show Citizens Watch (murder mystery inspired by BBC’s Broadchurch). Before taking an improv class, Brianna would nearly pass out while giving a presentation, and now she makes a living as a corporate trainer and advisor. Brianna’s past indie troupes include Aboulia! and Sweater Kittens, and she was a board member with District Improv from 2013-2016. She takes selfies with other people’s pets on Instagram @notmypet and helps her Siberian cat, Boba, with his page @bobathesiberian. Laugh too loud. When people look at you, laugh louder.